Festival of India at Yonge-Dundas Square ~ The Toronto Hare Krishna Temple! Can’t wait for Festival of India (Ratha-Yatra) on July 13-14th? No problem! Come and join us for the Festival of India launch party on Yonge-Dundas Square. The pre-festival is held on July 6th 2013, one week before the Festival of India itself. A can’t-miss event in its own right, the Yonge-Dundas Square Festival of India Launch Party features a cavalcade of activities, attractions and performances, including a South Asian bazaar, traditional delicacies and foodstuffs, henna tattoos, face-painting, dress-in-a-sari booths, and more! Don’t forget to stop by our live art exhibit and vegetarian cooking demonstrations happening throughout the day. Yoga enthusiasts will be intrigued to discover that the event also features outdoor yoga classes given by Toronto’s prominent studios. Last year was a huge success with three packed classes, attended by regular yogis and people passing by! Be sure to hang around towards the evening to participate in the climax of the day’s celebrations- kirtan with Madhava and many more renowned kirtaneers! 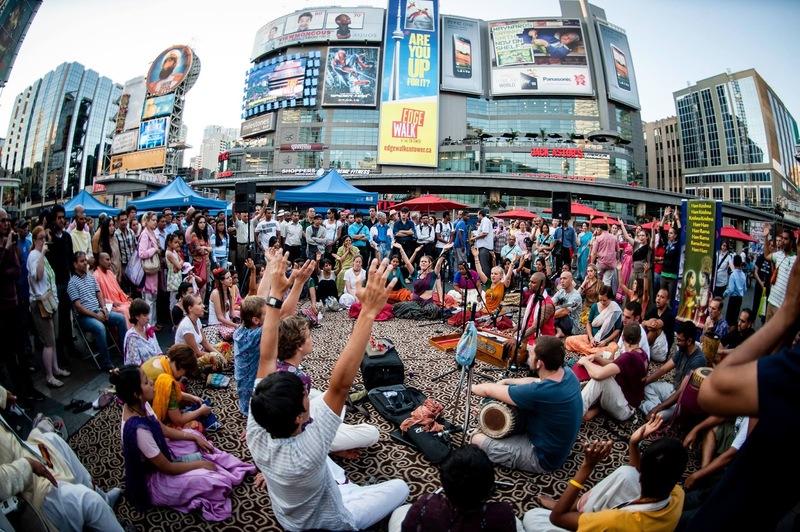 Beginnning at 6 pm, the kirtan promises to transform the heart of downtown Toronto into a sublime experience! The ancient mantras (kirtan) from east will reverberate and grace the grit and steel of our downtown metropolis. With renowned singers from around the world, it can only be described as a ‘kirtan explosion’ that will certainly shake Toronto! Everyone’s invited to come taste and participate in the mystic exoticism of the 41th Annual Festival of India at Yonge-Dundas Square.